When Mary Bortscheller and Kira Hettinger joined the firm of Cohen Milstein Sellers & Toll neither knew the life changing impact they would have on two young girls. Both Mary and Kira work in the Employee Benefits practice group at the firm, but for the past year and a half have also been working on a pro bono immigration case for Isabelle* and Dara*, two sisters from Honduras who are now nine and seven years old. The firm began working with KIND through Linda Singer, a partner at Cohen Milstein who has zealously advocated for taking on unaccompanied children’s cases at the firm. When Isabelle and Dara were only five and three years old they were abandoned by their father. Their mother then came to the U.S. to try to support them and left the girls in the care of their great grandmother. 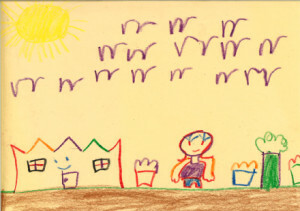 Soon after their great grandmother became verbally and physically abusive to Isabelle, and did not provide enough food for either of the girls. Once their mother learned of this mistreatment, she sent the girls to live with their paternal grandmother who agreed to house them only if she was paid. Their grandmother also mistreated and neglected the girls. She eventually told their mother that she could not house them anymore. With no one left in Honduras to care for them, Isabelle and Dara were at risk of becoming street children. This was the last straw; they made the trip alone to the U.S. at only six and four years old hoping to be reunited with their mother. Once reunited with their mother, the girls’ need for an attorney to represent them in their deportation proceedings became acute. This is when KIND received a referral for the girl’s case and was connected with Mary and Kira. “Once I started to become aware of the intricate and overlapping laws that were involved, and the administrative and legal processes’, and the adjudicative authorities we have to navigate on their behalf… even though it is relatively simple for us to do as lawyers, it would be basically impossible for our clients to navigate on their own.” Mary said. Mary and Kira have thus far been successful in helping the girls attain Special Immigrant Juvenile Status for children who were abused, abandoned, or neglected by a parent. However, even with the legal portion of their case on track, the girls still needed help. Mary and Kira explained, “Okay we have a plan, we have a legal strategy, but then we thought, wow they need more than just legal help…the needs that they have as young girls, are numerable. 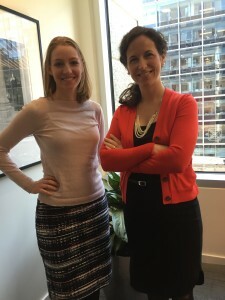 Getting them access to medical and dental providers was really the first step.” This is when Cohen Milstein Partner Linda Singer reached out to Elizabeth Roos at Temple Sinai in Washington, D.C. to see if they could help. When Elizabeth heard about Isabelle and Dara’s medical and dental needs, she reached out to the Temple community for help. Immediately, a pediatrician offered her services pro bono, a dentist offered his services pro bono, the head building inspector for the Temple offered his help translating, and another member who is fluent in Spanish also offered her assistance. Elizabeth has developed a relationship with the two girls and their mother, also helping them enroll in school and advocating on their behalf. At school, where both girls are in the first grade, Elizabeth met with the girls’ teacher who suggested the girls get audiobooks to help them learn English. This suggestion, and the subsequent progress Isabelle experienced, led to Isabelle being named “student of the month” in her class. “The generosity and compassion from the people at Temple Sinai I don’t think can be overstated,” said Kira. The Temple even raised money so the girls could attend summer camp. Stay up to date on what we're doing. © 2008 - , kind all rights reserved.